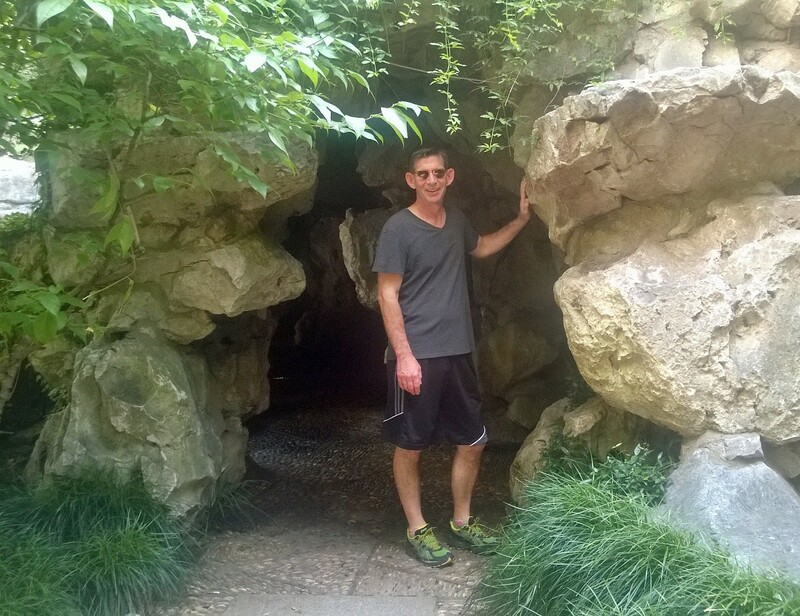 Who knew we had caves, a waterfall and a maze on the grounds of our apartment property??? WTF! Seriously, we have lived here for almost one year and this past weekend we finally stopped having adventures outside the walls of our property and spent time exploring closer to home. It got hot and humid so walking for miles wasn’t appealing to me so we decided to have a more “local” adventure. 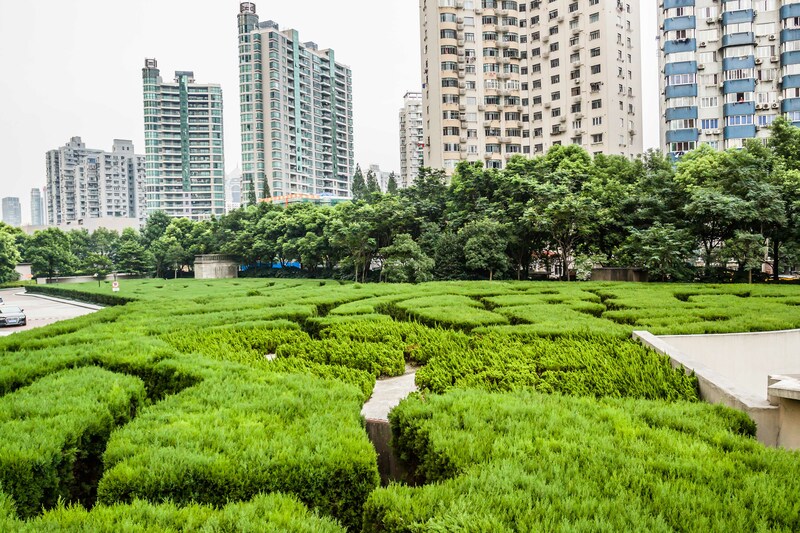 On our side of the complex (total of 7 buildings with Weifang Road splitting the property into two sections) we discovered, among other things, a real life huge maze. My first thought was “Why? ?” but I felt very Harry Potterish as I threaded my way among the hedges though I didn’t find any port keys but I’ll keep on looking. There is actually a tower built to observe the action as people try to find their way out and two sections–low shrubs even shorties like me can see over and tall ones that even Thom couldn’t see over. Then, next to the maze was a beautiful formal garden with statues and fountains. Thom and I want to take over the management of the grounds so we can rent out these places for parties and events–they seem to be very underutilized. Party time-let’s enjoy these beautiful spots! Then we decided to try the other section to see what we could find and, amazingly, we found a section where a cave and tunnels had been carved out. Again, I wondered “Why? ?” but as I doubt that many people had ever discovered these as they are hidden towards the back of the property but someone was parking their scooters in them so someone was using them for their own personal parking lot. If we ever need a hiding place, this is it! Next to the caves, we discovered a gorgeous waterfall and lake with koi swimming under the bridges. The traditional buildings house a restaurant, spa and dry cleaners–right on property! We knew about the little grocery and liquor store on site–they deliver for free and it’s super convenient but have never been in these other facilities. Leave it to me to know where to buy wine as close to home as possible. That I’m never to busy to find out. My best friend and her husband will visit us this fall for a month. We can’t wait to show them all around and have new adventures. 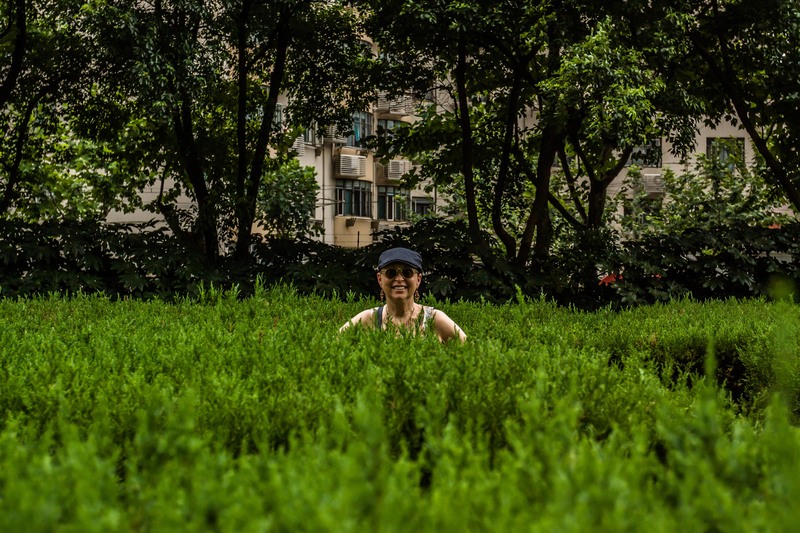 Now we that we know all the hidden gems on our own property, we will show them around and they can explore the beautiful grounds when they need a break from the hectic life on the streets of Shanghai. 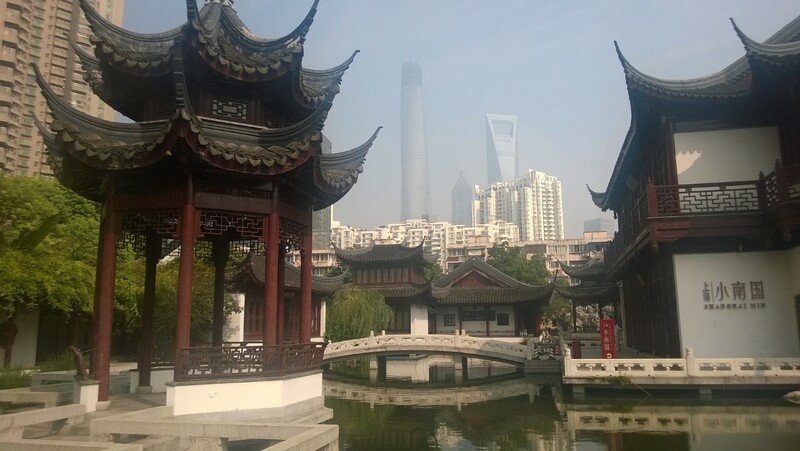 Pond, waterfall, and a view of downtown Pudong-all on property!